I suppose some background would be in order here. 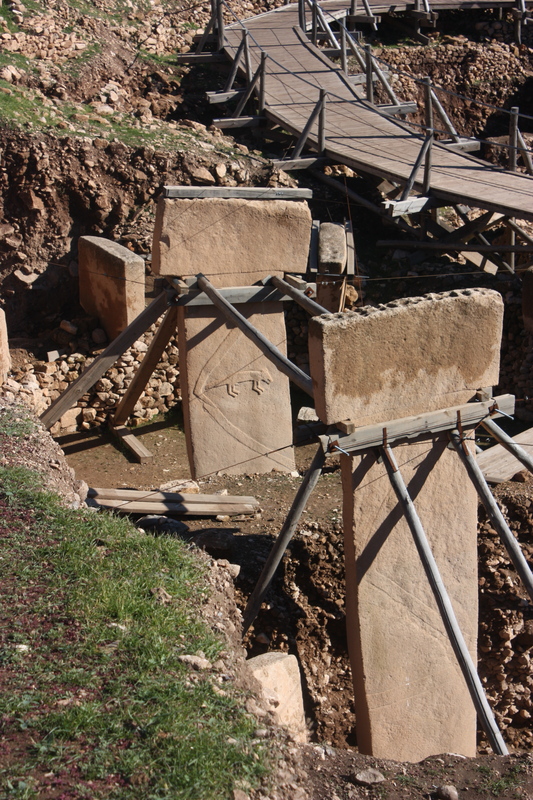 Göbekli Tepe is a site in South-Eastern Turkey, about 20km from Şanlıurfa, and about 40km from the Syrian border. It lies between the Tigris and the Euphrates, and is more or less in the middle of the Fertile Crescent. It is situated on a limestone hill, and is the highest feature in the landscape around. According to carbon datings, the site was founded approximately 11500 – 12000 years ago, at the very beginning of the Neolithic era, and right at the end of the last Ice Age. 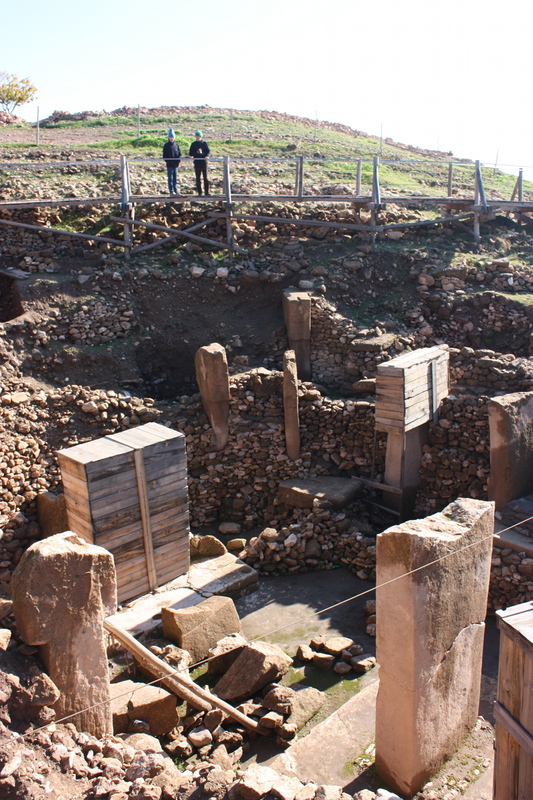 Archaeologists refer to the period as the Pre-Pottery Neolithic, which is generally divided into two: PPN A and PPN B, and Göbekli Tepe starts at the beginning of the PPN A. It appears to have been inhabited for 2000 years, then back-filled by the inhabitants and abandoned. Pillar with bags (?) and birds emerging from the dig. The area is thought to have been lush at the time, with forested valleys and highland grasslands, all teeming with game and full of edible plants, including the precursors of barley, wheat and rye. It seems to have been so congenial that it allowed an unprecedented lifestyle: sedentary hunter-gathering, which means that humans established settlements where they lived most of the time, and were skilled in exploiting the land without having to move on. 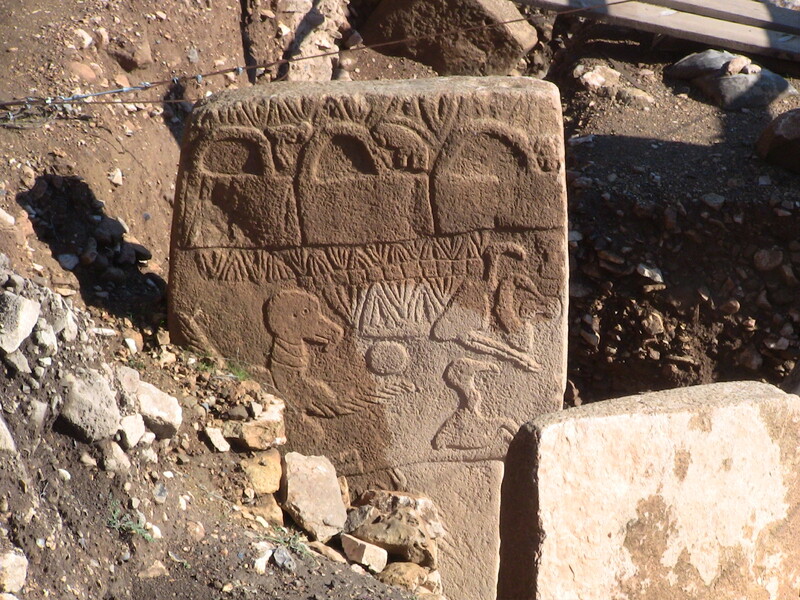 Göbekli Tepe is not such a settlement. Rather, it appears to have been built by sedentary hunter-gatherers for non-residential purposes. Stone Circle seen from above. Some pillars are covered over. Beyond this, everything is speculation. We don’t know what they did there, (though feasting seems a possible component in view of all the bone fragments) or why they did it. We don’t know what the carved forms on the pillars meant for the builders, and we are scarcely in agreement about what they mean for us. But we can safely say that the entire complex meant A LOT to them – enough for them to invent new technologies and put in vast amounts of physical labour to achieve it. So it has a rather special status – standing as it does at the very fountainhead of what was later to become “civilisation”, it is nevertheless an unknown. Its pillars, writhing with carved life, are blank of meaning but present a rich ground for projection. We can note that the depicted forms are almost entirely male, that they are often of an aggressive or threatening nature (lions, boars, scorpions, lots of snakes, etc.) but that there are also food animals depicted. We can observe that many of the pillars have arms, hands, belts and loin-skins, and deduce that they represented beings of some sort, but we don’t know what sort. Ancestors? Proto-gods? We neither know nor can we have any idea of what the original builders’ and users’ experience of these things were. We can see in the excavated hollow in the hill the layering of the stone circles, one above the other, and deduce that they were bringing in enough material to significantly raise the ground level, but we don’t know why, or whether it was a slow accretion, or if the material was brought in in one or more pulses of activity. 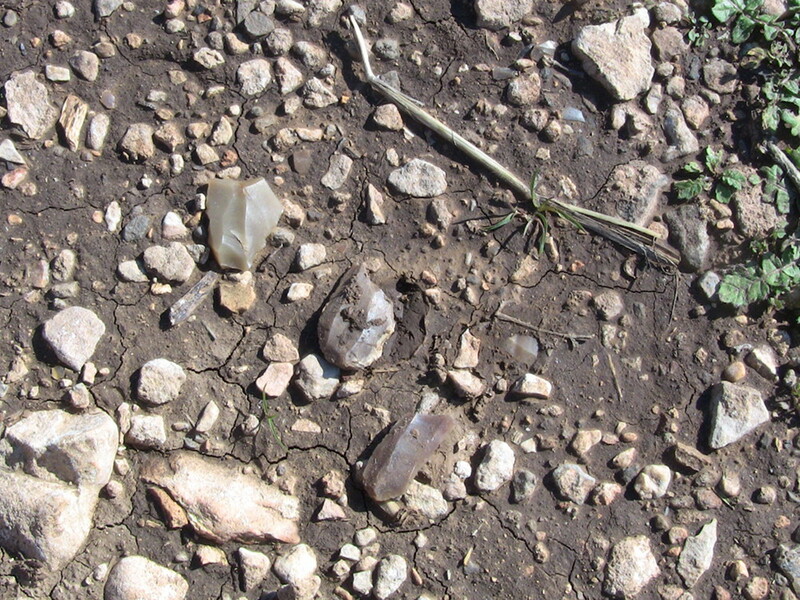 We know that much of the back-fill consists of what one might expect to find on a PPN A midden or garbage heap (but not on a “temple”) except for the admixture of a great number of smallish limestone stones – material of a portable size, from fist to pebble. Central pillars. Note the arms, and the fox on the further pillar. One can look at broken pieces of limestone tuns or barrels, as well as a few complete ones, and wonder what was in them. Klaus Schmidt and others think they may have found remains that are diagnostic of brewing barley beer, but one can’t really be sure. Limestone vat near the “Lion enclosure”. One can speculate whether the preponderance of bones from crows, ravens, rooks and vultures indicates that the site had something to do with the disposal of the dead. 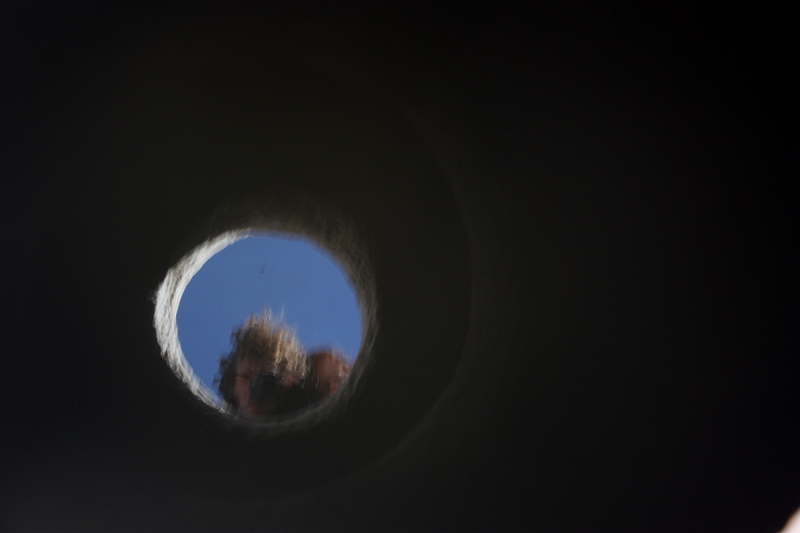 One can wonder about the meaning or function of the circular holes that are found in various pillars and stones, or the doorway-shaped openings in others. But eventually we must concede to our ignorance, and to the manifest presence of the things themselves, their poignant signification of ancient concerns, of loss, of time that passes, of their position at the very beginning of who we have become. What we have, besides our ignorance, is the pillars and structures themselves. And the pillars are, in the original sense of the word, awesome. In-turned, solemnly facing each other across their oval or circular spaces, they have weight and presence; they stand upright like people but are higher than mammoths; they have endured great time. Though science may extract various facts and numbers from them, our only route to their meaning is finally a sort of empathy. Pillar which was excavated fallen. If the place is to be seen as humanity’s first (known) attempt to make something (we might now call it architecture) that was seriously awe-inspiring, it can also be seen as an early serious commitment to place, or to a place. This is no longer the intimate and mostly portable sculpture of the Palaeolithic, whose owners had to move along to follow the source of their food. These people made a place that was itself an artefact, at which at least some of them could dwell, and to which they could and return. They used it for 2000 years. If you stand among the stones and try to imagine what these things meant for their makers, you cannot fail to be impressed, to be filled with both wonder and wondering. The necessary art of anatomical dissection has saved many lives, and continues to do so. Without its procedures, medical science as we know it would not be possible. But we can’t really look at the image without wincing, for all the knowledge that it brings. At Göbekli Tepe it’s a little the same. The hillside has been cut open for the sake of knowledge, revealing the layers and strata of the hidden interior, and bringing to our eyes structures that were previously unseen. There’s a certain brutality about the process. Knowing that everything removed from a site is irreplaceable, and thus that excavation is a type of destruction, the archaeologists must nevertheless dig, with deepened knowledge of the human story as the prize. Of course, nothing is simple. The archaeologists must work under multiple pressures, and fit their painstaking activities in with the weather, with the pressure from local authorities to excavate the site quickly so as to make it available for tourism, and with the sometimes conflicting imperatives of revelation and preservation. 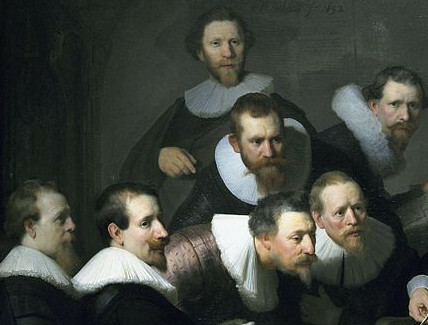 Every generation of archaeologists finds the previous generation’s techniques problematic, as techniques get more and more refined. What for one excavator is material to be removed in order to expose the more interesting objects below, may for another present a rich trove of information through analysis of pollens or changes in dust deposition. The millions, perhaps billions, of flint tools aren’t of much interest – whereas for a British archaeologist a trove of 50 flint tools would represent a significant find. But we all do want to know what’s in that mound, and the only way to find out, short of still-unheard-of technologies, is to dig it out and have a look. The hillside has been stripped of its skin of living plants and soil, the connective tissue of rubble, bones and flints removed, and the walls and pillars lie revealed like organs and bones. The photos show clearly the tensions between preservation and spectacle. Preserved for all those millennia, the stones are now exposed to the weather. Those with more detailed carving, it seems, are encased in wooden boxes during the winter months. The pillars need a complicated system of wires, stays and bits of wood to remain upright. And, because of the precariousness of the whole arrangement as well as to protect the stones from despoilation by tourists, the pillars and their immediate environment are not accessible. Wooden walkways have been constructed which allow the spectator to look down on them. This gives the exact opposite experience to the intended one. The builders of these enclosures went to great pains to make big pillars and carry them to their intended site. They clearly wanted something which would overwhelm the spectator. 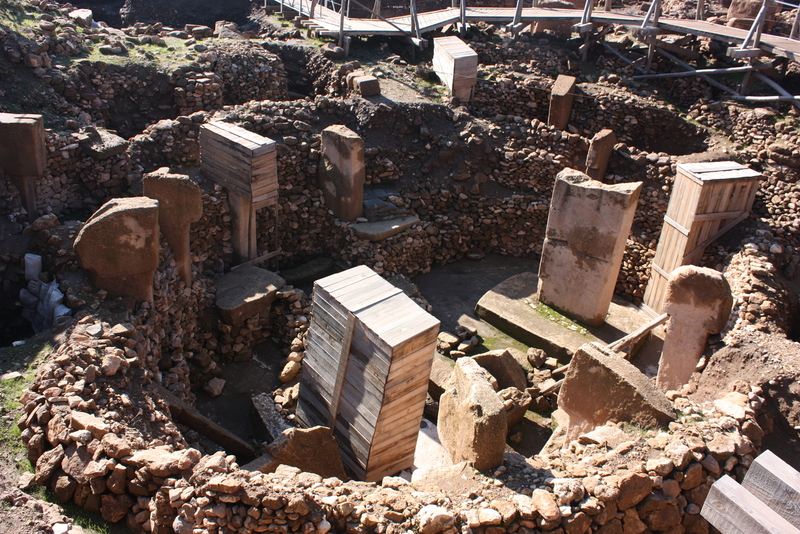 The pillars at Göbekli Tepe are arguably the biggest things made by humans up to that time. By marking them with arms, belts etc, they were signifying that these are beings like us, and they wanted really big beings. Seen with their heads at knee-level or below, the pillars are diminished. In any case we have seen many bigger things, and are less likely to be impressed by sheer scale than people of the Pre-Pottery Neolithic. Nevertheless I was impressed, almost overwhelmed. In the next post I’ll try to work out why. Imagine a flat limestone plateau, the highest feature in the countryside around – anything higher is way over on the horizon, where various dim blue mountains, including Mount Nemrut, can be seen. 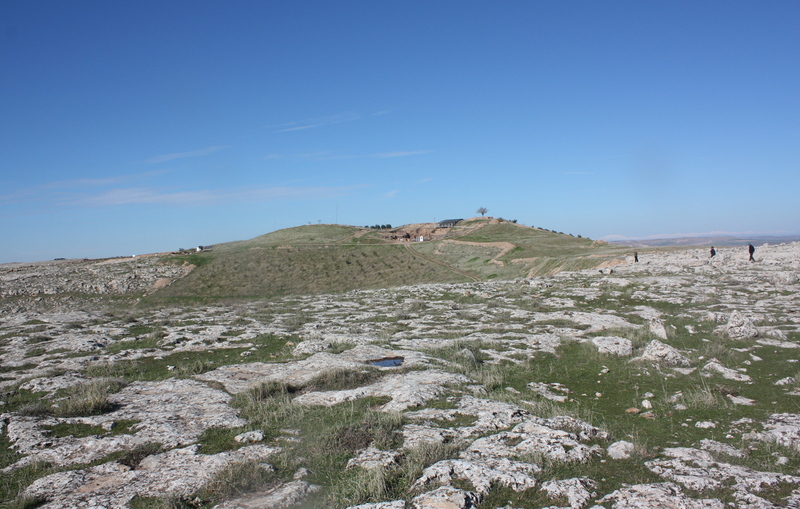 The only vegetation is the short winter grass that covers the hills and a paradoxical stand of olives right on the top. In the summer, when the grass has withered, the place is dry and semi-desert. On the one side of the plateau is a round hummock. 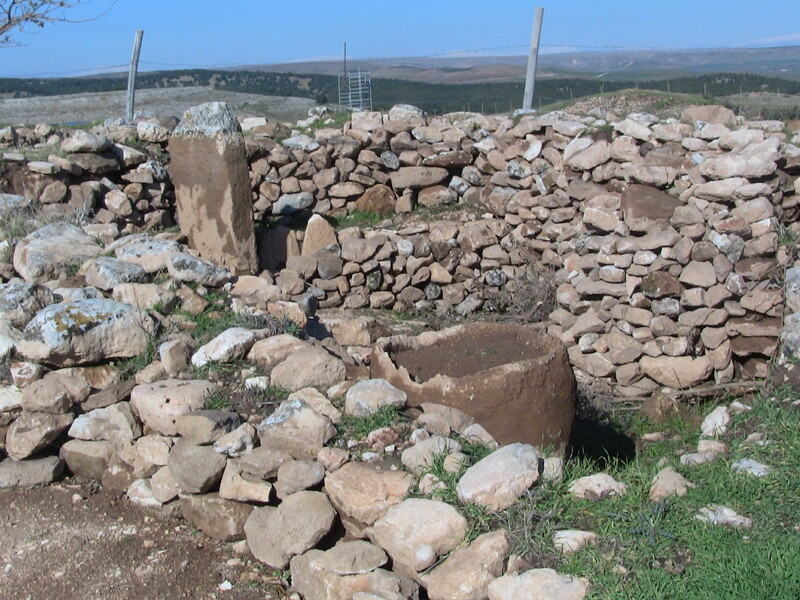 Göbekli Tepe means “Pot-belly hill” in Turkish and it is to this hummock that the name refers. 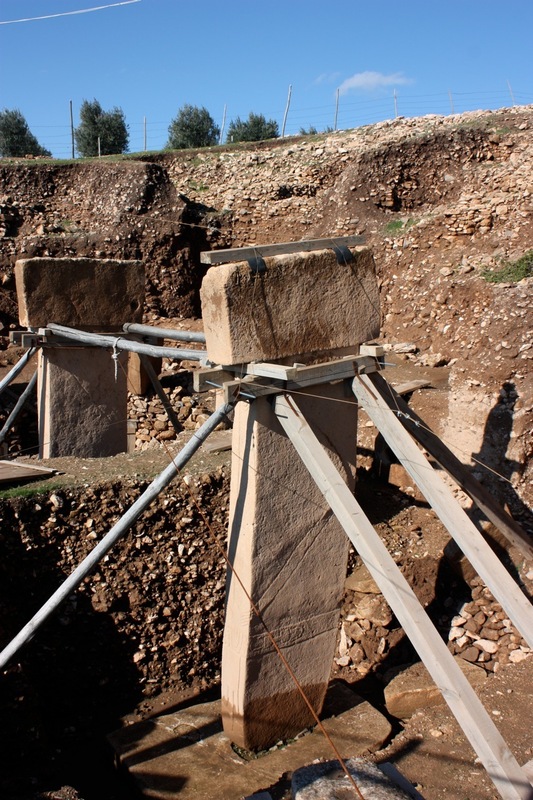 There’s no geological reason for a round bump of mixed rubble to stand on top of a limestone plateau, and it turns out that although Göbekli Tepe is big, it is entirely human-made. Inside the rubble are the remains of more than twenty large circular stone enclosures, dating back to a two-millennium period that began eleven and a half thousand years ago. Once, we are told, the area was a paradise. Forested, at least in the valleys, teeming with wild game, and full of the grasses which would become wheat, barley and rye, it was so lush that the human inhabitants were able to adopt a pretty-much unprecedented life-style: Sedentary hunter-gathering. This means that the local ecology was providing food faster than the humans could exhaust it, and they were able to settle down. They still had no pottery. Bones of a great variety of animals have been excavated at the site, but there is no evidence of domestication. 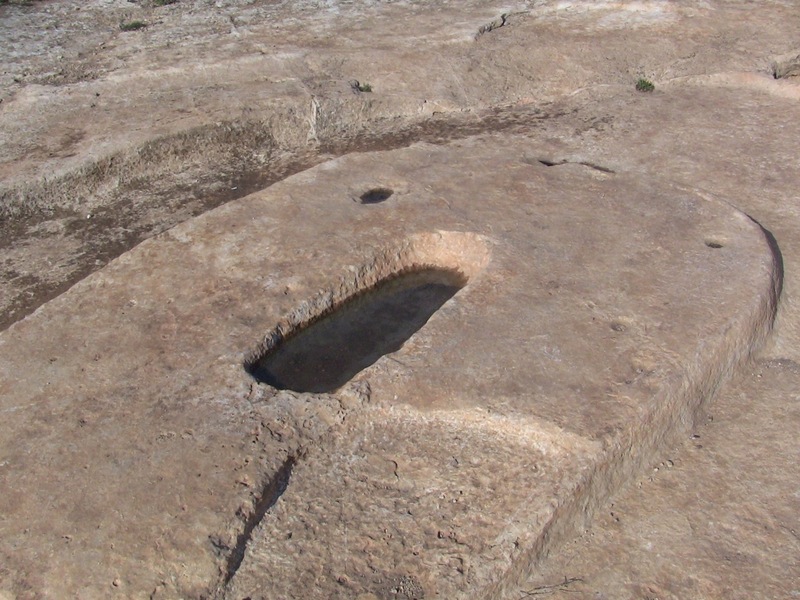 Stone table with cup-shaped indentations and plinth. Before encountering the excavated mound, one comes across areas where wide rock surfaces have been enhanced. Here are a series of cup-shaped indentations carved in the limestone, as well as a pediment for a pillar. The rock is also cut with channels whose function is to catch run-off and direct it into several cisterns. 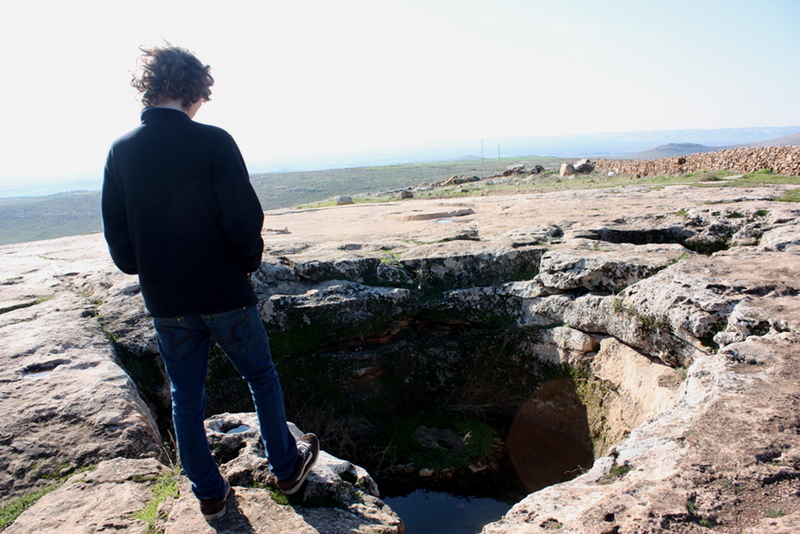 Even if the climate was more forgiving then than it is now, this is the top of a hill and has no natural springs. For people to have conducted the mass activities that the excavation suggests, water must have been important. It’s not feasible to carry water uphill in quantities that could have sated the thirsts of the hundreds of people needed for the transport of each pillar. I don’t know if anyone has conducted a study of these water-works. They would provide a meaningful upper limit to the number of people who could be accommodated on the hill. If one is alert, the very ground on which one walks can take on a meaning. Bone fragments, flint and obsidian tools, and lumps of chalky limestone lie everywhere. Everything is an artefact, and was put or dropped there by people. This picture is not cherry-picked – it’s just a part of the pathway, and all of the ground is like this. In a more meticulous conservation environment one would walk on a raised walkway. Here’s another random view of the pathway. 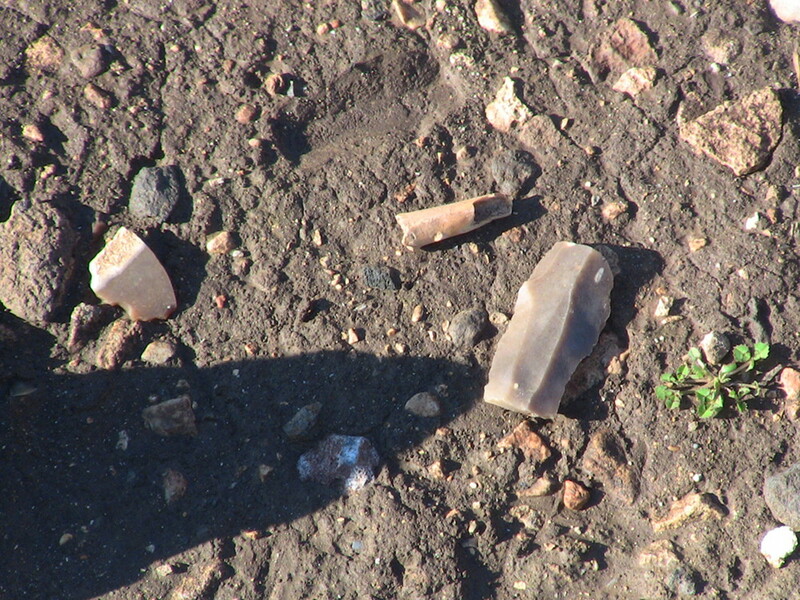 Enlarge it and count the flint tools and flakes. Before I arrived at the excavation pit, the whole thing shifted for me. I realised that it was all artefact, that everything marked the ancient human presence, not only the potentially awe-inspiring pillars in their enigmatic circles. So I could approach the whole mound as itself an ancient mystery, rather than as something that obscured the more interesting structures of pillars and circles which are embedded in it, overlapping, built one over the other. 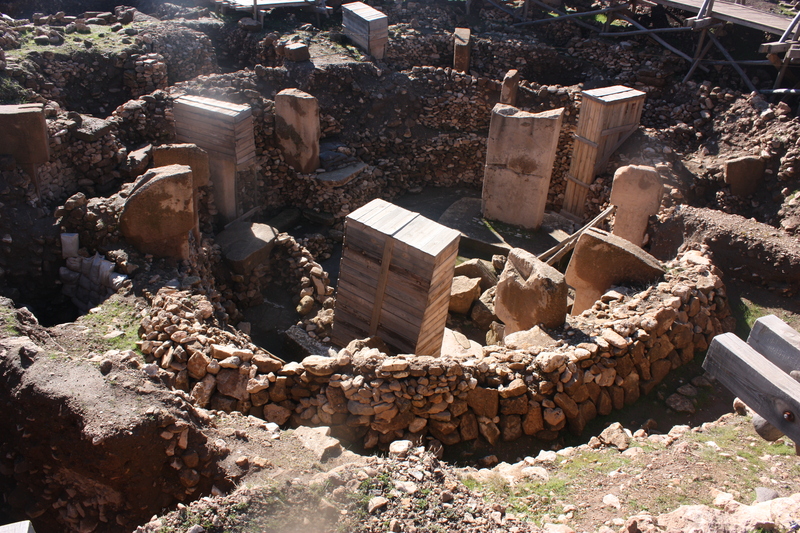 The accretion of stones around Göbekli Tepe, like almost everything else about it, remains unexplained. I imagine that for ancient visitors to the site, carrying stones was an important part of the ritual associated with going there. Large parties of people would have been required to carry and place the very large number of stones that make up the structures. It is clear that a lot of additional stone was carried in. My speculation is that visiting the site somehow involved bringing stones and adding them to the mound. Eventually the ground level would rise, and new structures would be built on top of the old. 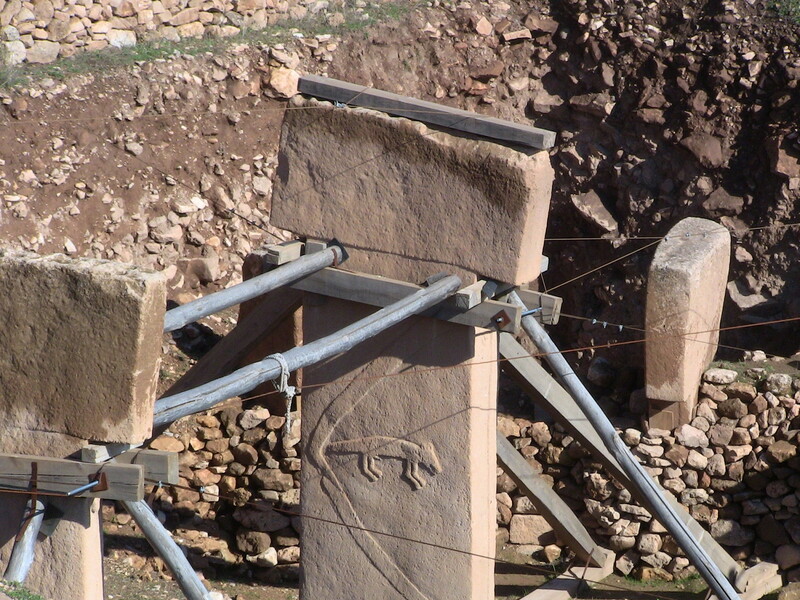 More on Göbekli Tepe in my next post. We’ll actually get to the stone circles. Göbekli Tepe stands on the top of a high limestone hill in the bleak countryside near the Turkish city of Sanliurfa, or more commonly Urfa, in South Eastern Turkey, 40km from the Syrian border. Situated between the Tigris and the Euphrates, it lies roughly in the middle of the “fertile crescent” – though the immediate countryside does not present the appearance of much fertility, a topic I’ll come back to in a later post. It is the oldest built temple that we know of. Dating from the very beginning of the Neolithic, about 11,500 years ago, the people who built it were hunter-gatherers who had neither pottery, agriculture, or animal husbandry. By the time they left the site, perhaps 2000 years later, all three of these practices were in place, and humans had embarked on the path that would lead to civilisation. It has been partly excavated by teams of German and Turkish archaeologists for the last 16 years or so. Only a small portion of the site has been excavated so far. What has been revealed by these excavations is staggering: A series of stone circles (four have been excavated and there may be as many as twenty more underground) dominated by large, sometimes elaborately carved, T-shaped stone pillars or monoliths, up to 5m tall. These stone circles are in an excellent state of preservation because, for unknown reasons, the builders of Göbekli Tepe covered the entire site over with hundreds of tons of mixed rubble before departing. For 9 500-odd years nothing was exposed to the weather, nothing was plundered for building material or turned over by the plough. This means that, paradoxically, its stones are better preserved than those of some much more recent sites elsewhere – even Roman or Byzantine. We visited in December 2012. 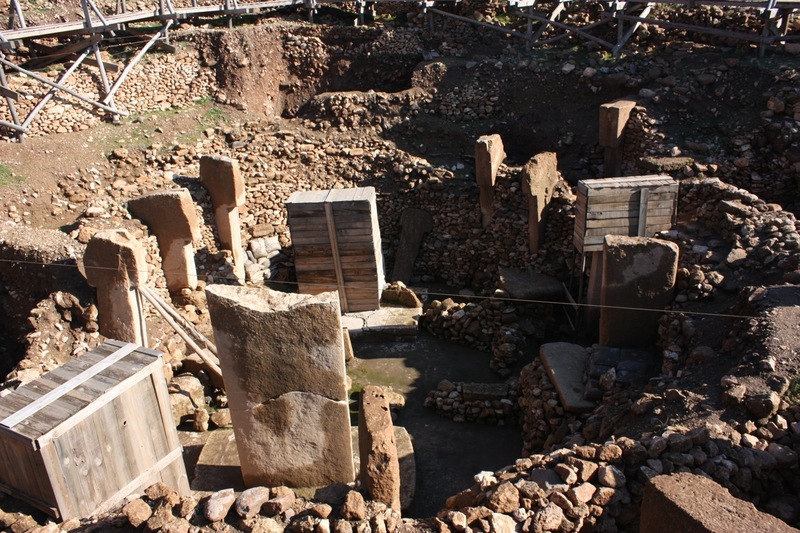 Unless they are locals, visitors to Göbekli Tepe are investing considerable resources in getting there. But they’re likely to be disappointed unless they have made a parallel journey of knowledge. In other words, if you don’t know what you’re looking at, you might not see anything much. In prospect, the site is awesome – one learns about it from articles on the internet, most of which point back to an article in National Geographic, where huge stone monoliths loom over the camera, which comes close to the dramatically-lit stone carvings. 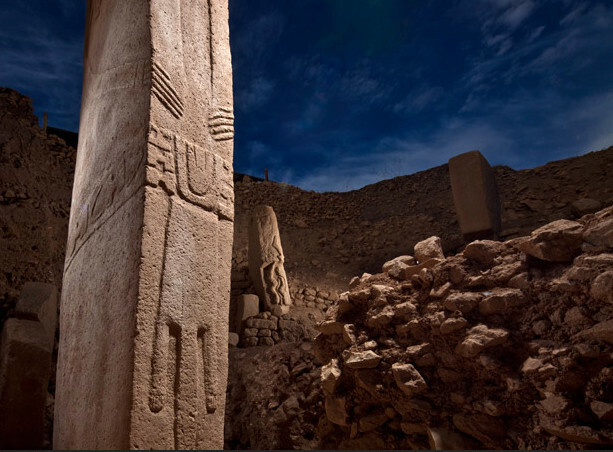 A view of Gobekli Tepe from the National Geographic article. Who wouldn’t want to stand in the oldest built room, surrounded by pillars that are clearly also beings, and re-experience the spatial dimension of what the builders of the place experience? Well, you can’t. And it’s not that simple anyway. For perfectly good reasons to do with conservation, the stone circles are not directly accessible to the public. 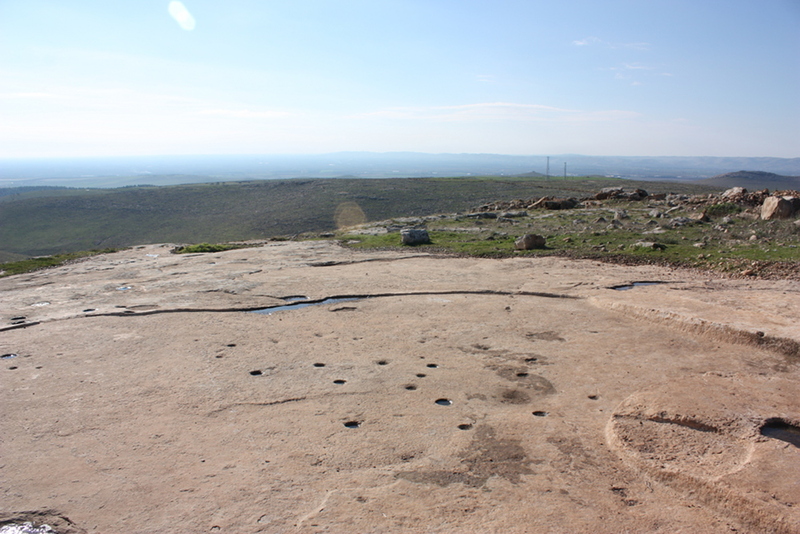 One can see, beyond the excavation on the stone plateau, the initials and graffiti left by contemporary visitors. Other reasons are architectural. The people of 11500 years ago weren’t really great architects, and their structural methods were simplistic, even though their masonry was not crude. 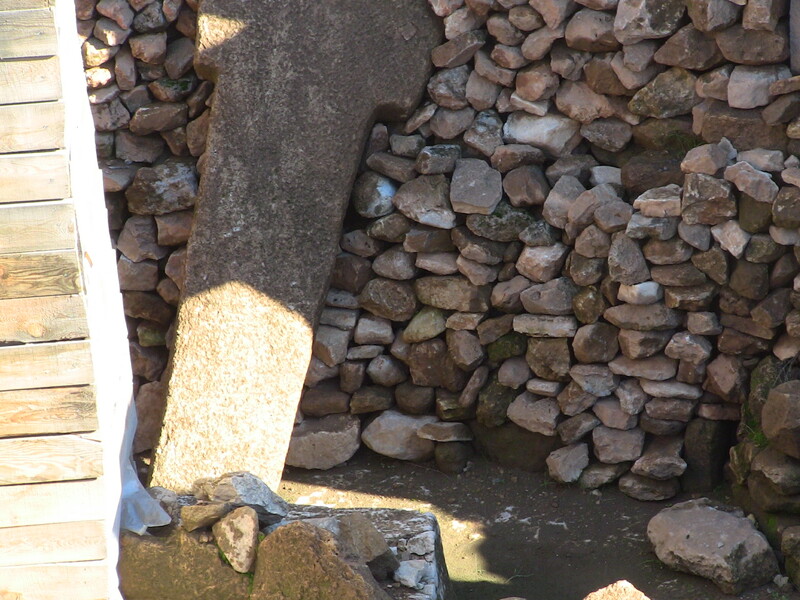 The structures revealed by removing the rubble are not stable, the stone pillars standing precariously in their prepared slots in the floor, some having toppled over. The public simply should not go in there. So we look down on the structures from boardwalks erected around the pits of the excavations. In the winter, some of the pillars are covered with wooden boxes – seemingly to protect them from the weather. There is no dramatic lighting. Everything is wet or drying out – there has been recent winter rain. 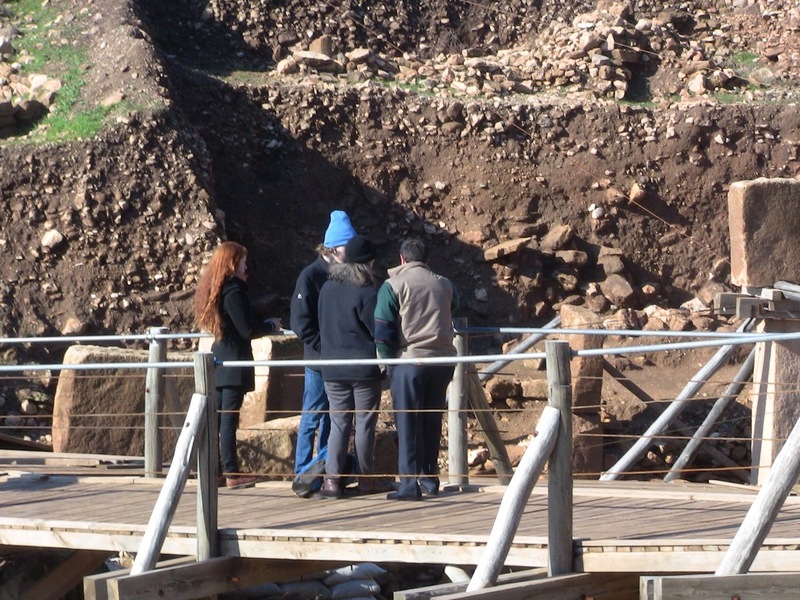 Boardwalk above the Gobekli Tepe excavation. Many of the pillars, down at foot level, need help to stay upright. The pillars were slotted into keyhole slots in the stone base, and I winced to see how almost-aligned this pillar is. You’ll have to click on the picture to see it. The scaffolding is clearly necessary, but visually intrusive. You can see the rubble exposed in section. In the cut-away hillside in the background shows more, and patches that may indicate structures rather than random stones. 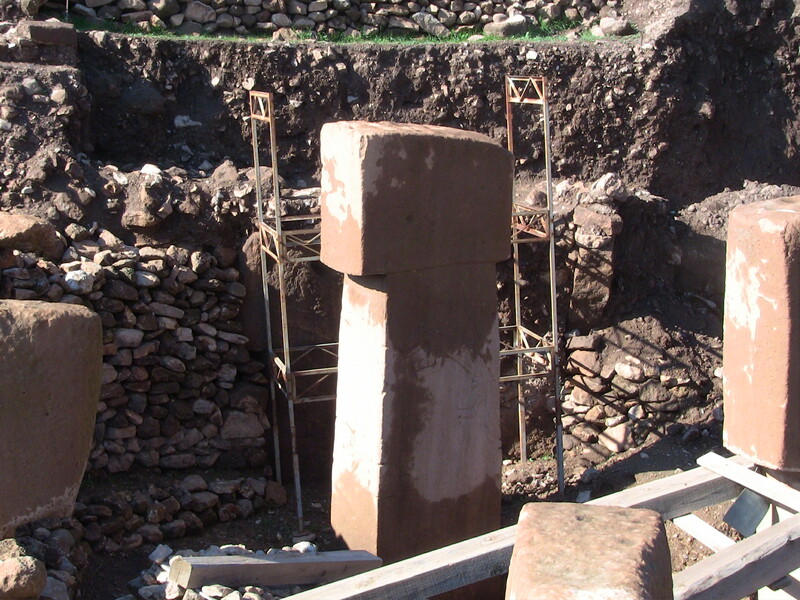 Pillar base carved into bedrock: Göbekli Tepe. I felt great sympathy for the archaeologists involved in the dig. Basically, everything is an artefact, deliberately put there – the whole of the Gobekli Tepe mound having been put there by people. So some of the artefacts – stone pillars, walls, floors – needs must be privileged, while others – fist-sized rocks of the local limestone, bones of birds and animals, needs to be carefully sifted, labelled and put aside in order to expose the structure: the walls, seats, floors and circles or ovals of pillars that are exposed. The rubble blurs things. 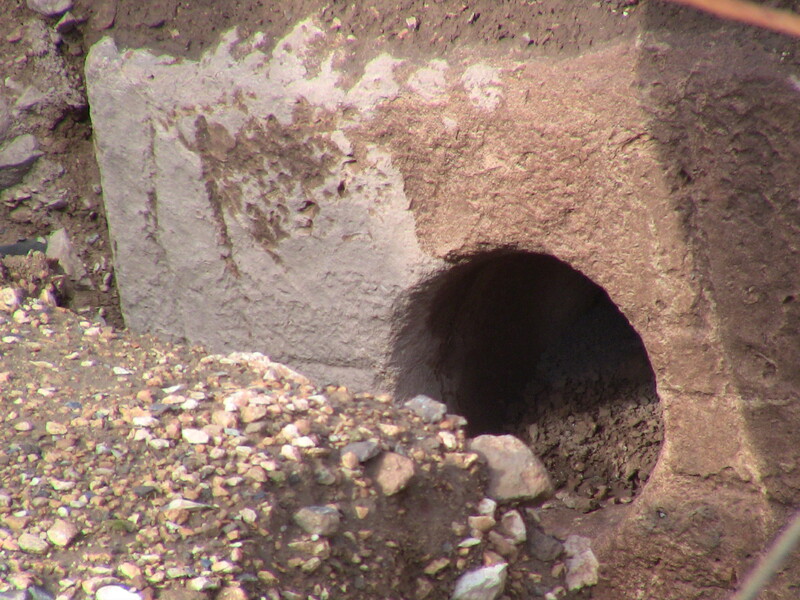 It appears that the entire site was subject to continuous or intermittent deposition of rubble. People kept bringing it in, either at a fairly steady pace or in surges, as, say, to bury a particular stone circle. This means that circles were built on the site on top of one another as the rubble got higher. It presents considerable problems to the excavator. To get at the lower strata, one would have to destroy the equally interesting upper layers. Nobody knows why any of this stuff was done, nor what the meaning of the stone pillars may be, nor do we have any idea at all what the people who built the stone circles were thinking. Anyone who says otherwise should be taken with the utmost scepticism, especially if they are promoting an agenda. These things are huge and impressive but they are diminished by perspective and the fact that you are looking down on them. I surmise that much of purpose of the labour of cutting and transporting the stones to the site was to give the intended viewer something seriously big to look up to. It all sounds a little disappointing, but it wasn’t. In my next post I’ll write about why.